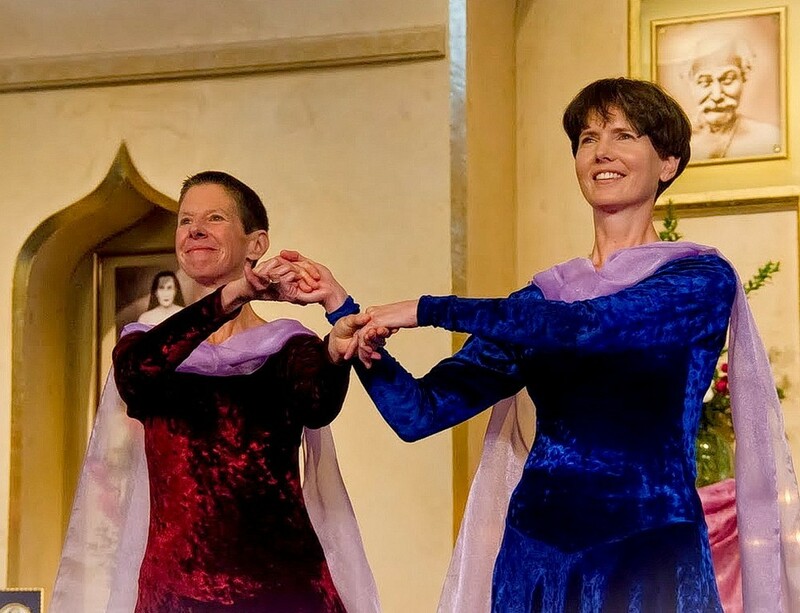 Rita Deierlein and Karen Beswick dance to a song by Swami Kriyananda, “That Emerald Isle,” at the Ananda Sangha temple in Palo Alto, CA. Photo by Nayaswami Rani. Click photos to enlarge. Karen Beswick was born in Marin County, on the rugged coast of northern California, just across the Golden Gate Bridge from San Francisco. The coastal mountains encompass some of earth’s most beautiful natural spaces. Karen’s roots as a dancer are deeply connected with the ocean and forests of her native Marin. While Karen was in elementary school, she watched the 1972 Olympics and was deeply inspired by the Russian gymnast Olga Korbut. Let’s listen to Karen’s story, as she reveals her spiritual journey as a gymnast and dancer. When I was in high school, I was growing fast, and I very quickly became too tall to be a gymnast at the level I wanted to be competing, and that my teammates were competing. So I decided to leave the sport. But the years of gymnastics training had given me phenomenal preparation for dance. In gymnastics, the routines are filled with dance. So you have to know many styles, from ballet, to jazz, to modern and interpretive, and things that people have never seen, where you’re choreographing your own routines and making them as original as you can. I always felt that my body moved well, and when I started dancing it was something that just made sense to me. I’ve always loved running and leaping through the air, and while I don’t do it as often these days, it’s still a great feeling. (laughs) It’s a wonderful feeling of freedom to be moving from the inside, and feeling free to be completely immersed in the moment while moving with inspiration. After dropping gymnastics, I stayed with dance until I married, and then I had to scale back when I had twin boys. I did sports that helped balance my stress, like running and walking. But the desire to dance was always calling, and I eventually began taking classes and performing again. Then a strange thing happened. It was a bit confusing and upsetting at first. I would take a class, and after six months I would find that I couldn’t do it any longer. It happened several times. The teachers were all excellent, talented and creative, but I would stay for six months and then I would realize that it didn’t feel right, and I would have to take a break. At the time, I wasn’t sure why it was happening – whether I was growing out of dance, or if I had simply reached a point where I’d grown tired of the teacher’s choreography. As I look back, I see that I was changing, and that it was changing how I felt about dance. The teachers were doing lots of hip-hop, with the moves that go along with that kind of music, and I just couldn’t do it. It didn’t feel right in my body, and the music was disruptive to my energy. I would look around in class and see that the other dancers seemed to be loving it, but I didn’t like it at all, and I wondered if I was losing my passion for dance, or if I was just getting too old. I didn’t know it at the time, but I believe now that I was being guided to find my own kind of dance and choreography. When you’re in someone else’s class, you’re doing their choreography, to their music, and it’s their energy that you’re imbibing. It can be fine, until you start feeling a need to follow your inspiration and your own soul’s journey. At that time I began taking classes at the Ananda Yoga Center in Palo Alto, and I started coming to Sunday services. And then I met Kristy Norfleet, who was directing a big production of Swami Kriyananda’s play The Jewel and the Lotus. I volunteered to help, because I thought it would be a nice stretch. When I mentioned to Kristy that I enjoyed dance, her eyes lit up and she carved out two scenes where we could insert some dance. She then asked me to dance a solo, and I had sufficient experience as a dancer to know that I would have to find some new training, because it would be very different from the kind of dance I was used to. Mainstream dancing is very competitive, and I knew I was going to have to change my understanding in this new setting, and that I needed to get some help to figure out where it was all leading. 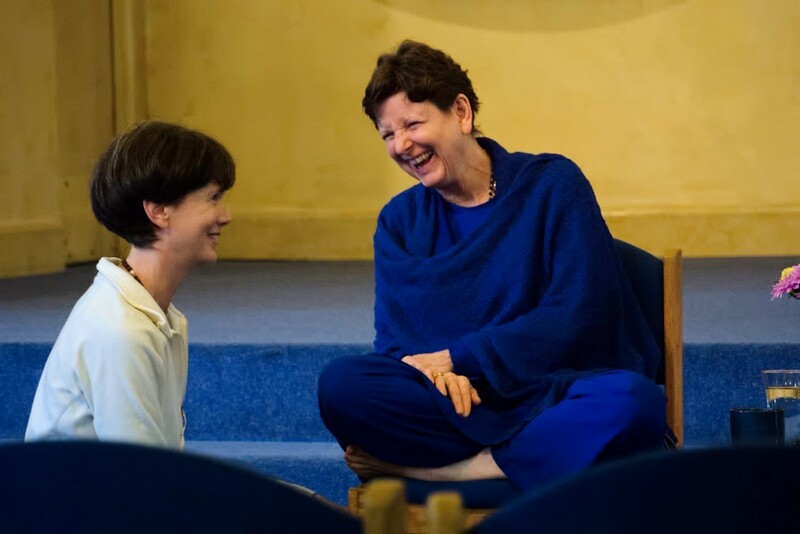 I discovered that Avital Miller would teach a workshop at the Expanding Light called “The Dancer as a Channel,” and I signed up, because I thought she might be able to help me understand how to approach this new path that I was seemingly being asked to follow. The workshop was amazing. It was very different from anything I had ever done in dance. Avital spent a great deal of time helping us get comfortable with doing our own dance movements. She had us move for fifteen minutes solid without any music at all, just tuning in to whatever our bodies wanted to do. Fifteen minutes is a very long time. But it was a great experience. It was the first time since I was a little kid, dancing on the beach in Marin, that I could feel my own divine dance coming through again. It was a beautiful discovery, because I realized that that original inspiration was still there. 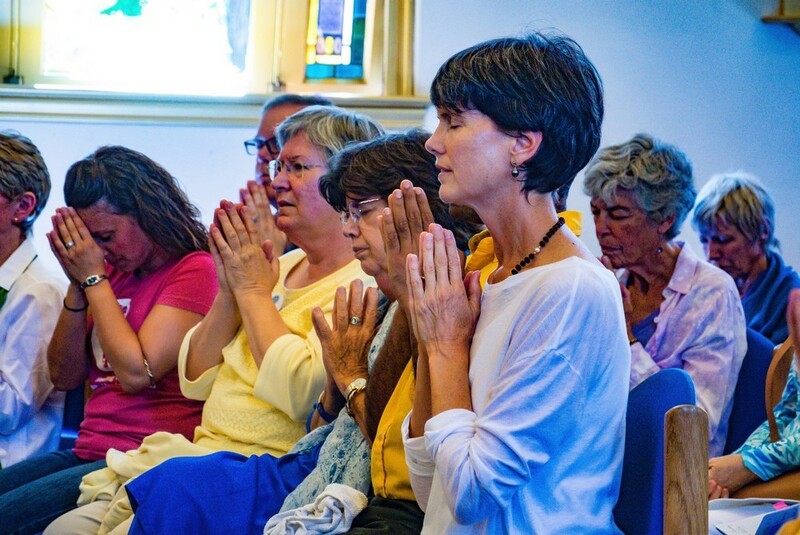 Karen worships with friends at Ananda Sangha in Palo Alto. It was the first time I had heard anyone say anything remotely like that. And between those two things, feeling the sense of my soul moving through my body again – or feeling my soul move my body – and being asked to focus on God, it flipped a light switch for me. For the performance, I was just totally terrified. I had to rehearse and rehearse and rehearse, and then I had to go back to my room and do yoga postures and legs-up-the-wall exercises and pranayams – (laughs) – and everything I could think of to try to calm myself down. Because now I would be dancing for God, and it was an entirely new and very different mode for me. I thought, “You’re dancing for God, and you’d better be really good!” (laughs) And to take it further, people would be watching us dance for God. It seemed so big and overwhelming that I couldn’t remotely get my brain around it. But it turned out beautifully, and I came away knowing that I had a starting place to begin working with Kristy on The Jewel and the Lotus. I began putting together the choreography for a group of nine dancers. Very few of them had ever danced before, and it was a surprising amount of fun. People feel so self-conscious about dancing for the first time, or they feel that they aren’t a good dancer, and working through all of that stuff with them was very powerful and sweet. It was such a privilege to go into that space with them and help them grow. They were so trusting, and they worked so hard on memorizing the movements and understanding how to do them well. Kristy had asked me to dance a solo, and it was very hard, not only because I’m always so nervous about performing, but especially because I would be moving alone up there on the stage. But I felt I had to do it, because I had to start learning to step through that fear. Another thing was that I felt guided not to choreograph this particular solo, but to let it happen in the moment. Of course, I knew that I had to prepare very deliberately to be ready for the moment. Because if you get up there thinking “I’ll just let it flow,” it hardly ever works. Even if you’re deeply attuned as a dancer, you have to work hard to prepare to be spontaneous, you might say. While rehearsing being spontaneous, I would dance to the piece during our rehearsals while trying to tune into how my body wanted to move. And as I noticed certain movements coming through, I would think okay, this is a new part of my tool kit, and when the performance comes I’ll have this to draw on. Karen with Nayaswami Asha, spiritual director of Ananda Sangha in Palo Alto. I knew that my back would be facing Master’s picture, and I imagined him pushing me from the back, at the level of the heart. It was the only way I could imagine to tune in to him in the moment. “Okay, Master, you’ve got to do this.” And he did, and I was able to take the first step, which led to all the other steps, and the dance felt beautiful. It felt wonderfully fluid while I was dancing the solo, as if a divine gift was coming through. Nayaswami Anandaprem was sitting in the front row, and when I glanced at her, I saw that her eyes were sparkling. We felt a very clear exchange, and later, she said to me, “Watching you dance, I fell in love.” And, you know, these are unfathomable things. I had never seen myself dance. I had watched a recording years ago, but for the most part you don’t see yourself dancing, so you never have a good idea of what is coming through. 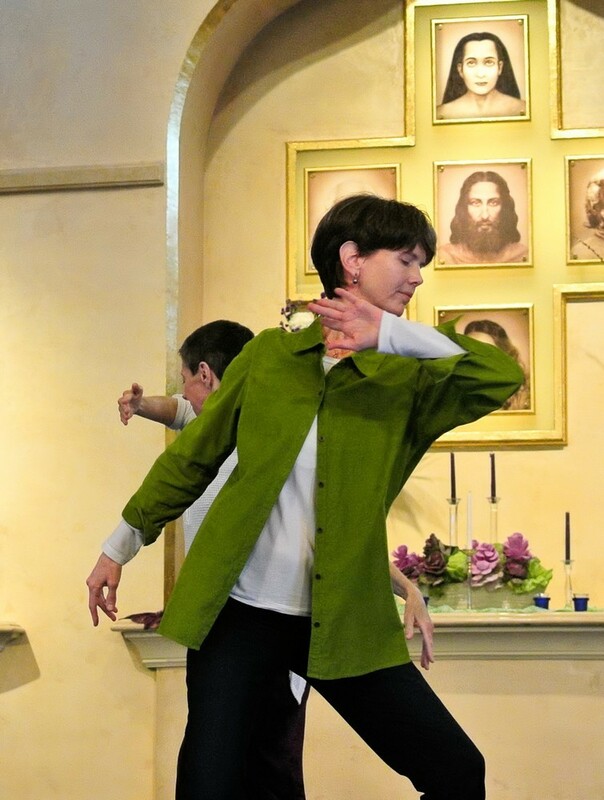 When Rita and I were working on a dance to Swami’s song “That Emerald Isle,” we decided to film ourselves, so that we could save our choreography and pick it up at the next rehearsal. We made a little iPhone recording and we watched it afterward, and I had no idea that the dance was so beautiful. It helped me understand what was flowing through us, and how it came across to others. But the important thing was that we were tuning in to the inner soul quality of the movements that were coming from a higher divine inspiration, and we were offering them as a gift, and feeling the divine blessing of giving what was flowing through us. The last time I had performed for an audience, I was really sick and tired of feeling nervous, so I did an entire hour of pranayams, just long, deep breathing, and it changed the whole dynamic. When I got up to dance with Rita, I felt completely free to give. And that’s the whole point for me now, because when the true spirit of giving is there, it’s pure joy to offer the dance to the audience, and to God. Thank you for sharing your experience. My heart was dancing all the while I was reading. Master’s Joy!